NEW--ORDER ONLINE with your credit card! Nearly 200 splendid images collected into a deluxe hardcover book. Edition is sold out--these are final author's copies! If you don't find exactly what you're looking for in the reviews on this page, please use this search box. Like all of the late Peter Palmquist's works, Pioneer Photographers of the Far West is thoroughly documented and carefully researched. And it bears another hallmark of Peter's style: it's filled with stories that are briskly written and highly entertaining to read. Co-author Tom Kailbourn shares the honors for this award-winning work, a crucial reference covering more territory and personalities than the title might suggest. Martin Gardner's landmark book The Annotated Alice unlocked the secrets of Lewis Carroll's beloved Alice in Wonderland & Through the Looking-Glass-- deciphering puzzles and explaining long-forgotten references to Victorian culture, so that a modern audience could again appreciate the wit and satire of the classic children's books. Now, Heinz and Bridget Henisch have done the same for a key work in the history of photography. The Photographic World and Humour of Cuthbert Bede presents us with the background and insight we need to understand the humor of Photographic Pleasures, Cuthbert Bede's 1855 lampoon of early photography. We meet the real Cuthbert Bede -- like Lewis Carroll, an English clergyman writing under a pen-name. The Henisches uncover Bede's other literary works and his fascination with photography (again like Lewis Carroll, Bede was an early amateur.) And they explain the barbs and jabs contained in Bede's clever cartoons. Any library with a copy of Photographic Pleasures (available in several original and reprint editions) should have a copy of this book adjacent to it on the shelf. It is the key to understanding and appreciating one of the most amusing and enjoyable works in the history of photography. Surrational Images: Photomontages by SCOTT MUTTER -- MUSEUM BOOK SHOP BEST-SELLER! I first came across Scott Mutter's work when we were both in college, more than 25 years ago. We studied photography at the same time, and when I saw his work on the walls of the Fine Arts building, I was dumbfounded. Back then, his darkroom work left a lot to be desired--but his images stood out from a sea of pictures that were technically superior. Here was an alternate world--a real and wonderful place--but clearly one that only Scott could show us. Rather than using the techniques of photomontage for shock effect, from the beginning Scott Mutter put together visual elements in a way that seemed to make more sense than the "real" world. It didn't take long for Scott to perfect the challenging photographic techniques--often involving multiple enlargers--that enabled him to fully realize his vision. His work is known internationally through a range of print publications including highly successful posters and calendars--and through this book. Surrational Images is a 9" x 12" hardcover that reproduces 34 of Scott Mutter's remarkable photomontages, together with the photographer's commentaries and an essay by Martin Krause. It is a measure of the book's success (and Mutter's popularity) that it has remained in print for seven years, selling out multiple printings. Click on the title above to order at 20% off the list price. For an image by Scott Mutter--the finale of our "Masterworks of Photography" exhibition, please click here. THE MOST IMPORTANT, MOST LAVISH PHOTOGRAPHY BOOK IN YEARS! 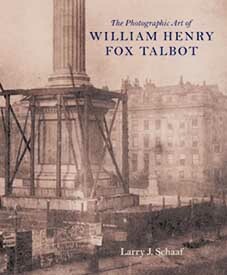 The Photographic Art of William Henry Fox Talbot by Larry Schaaf is nothing short of a monumental achievement-- a landmark work of photographic scholarship, and a magnificent example of the art of the book. This is the first book devoted to the photographic work of Talbot, who invented photography on paper. It shows us how this quiet, scholarly inventor explored the new medium he'd created-- experimenting with lighting effects and composition, pushing the creative envelope and developing a personal sense of photographic vision. This book is visually stunning, an instant classic, and so carefully produced that you'd swear you were looking at the original prints. It's huge (11 x 13.25 inches), and heavy (8.5 pounds) because of the weight of its high-quality paper. Each of the 100 images is printed in full color and in its original size, one to a page, with commentary on the facing page. There are many familiar images here, but as you've never seen them before: often in their original hues of lavender and mauve or with full margins showing how the paper was sensitized, or else from prints so perfectly preserved that they look like they were made yesterday. Some of these early images were shown in an exhibition at the Pierpont Morgan Library, in the dimmest of lighting, many years ago. Because of the ephemeral nature of these first photographs on paper, there may never be another show like that one. But having seen that exhibit, I can attest to the accuracy of the reproductions in this book. The great advantage is that you can look at the images in The Photographic Art of William Henry Fox Talbot in full daylight, allowing your eyes to focus on details and to see Talbot's work for what it really is: one person's experimental exploration of a newly-discovered visual medium. A remarkable and important book, Sights Once Seen is a fusion of the historical and the modern -- a story of one man's obsession with reconstructing a lost chapter in the history of photography and the history of the American West. Robert Shlaer spent four years following the trail of John Charles Fremont's fifth expedition of exploration--a punishing trip in the winter of 1853-54 to find a route through the Rocky Mountains for a transcontinental railroad. The daguerreotypist Solomon Carvalho made 300 daguerreotypes of the terrain from the Mississippi to Utah, capturing the image of the western wilderness. Nearly all of these hard-won images are lost--believed destroyed in a 19th century fire. In order to reconstruct them, Bob Shlaer first dug through the historical record to find clues to the route taken by Fremont and Carvalho. At times, his fine text reads like a detective story-- as Shlaer puts together his research, his photographer's sensibilities, and his intuition to recapture the lost images. The resulting daguerreotypes include hauntingly beautiful images of austere vistas and breathtaking landscapes. Shlaer has done something entirely original: after being instrumental in the revival of the once-lost daguerreotype process, he has used it to capture the spirit of discovery and adventure--and the record of natural beauty--that would otherwise be lost to history. Read Sights Once Seen and share the adventure. 176 pages. Hardcover, lavishly illustrated with 126 daguerreotypes in full color. Click on the title above to order. Bob Zeller's first book of original stereoscopic photographs of the Civil War was a runaway hit. A built-in viewer and Zeller's lucid text helped bring these 3-D images -- and the experience of the War itself -- to life. There was never any plan for a sequel, but Bob Zeller wasn't expecting to meet Robin Stanford of Houston, Texas. 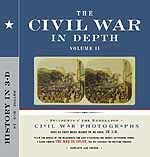 Ms. Stanford's remarkable collection of original Civil War stereo images provided a wealth of rare and important photographs, making Volume II a necessity. There are wonderful discoveries here, including a section of glorious hand-tinted images and exceedingly rare Confederate views. The book again comes with a viewer, and the reproductions of the photographs are significantly better than in the first volume. Zeller's selections and commentary are both entertaining and informative. And there's a bonus: the design by Jeremy G. Stout is a delight -- using antique type-faces to give this wonderful new book a feel of authenticity. If photography is the closest thing we have to a time machine, the 3-D images of the Civil War in this book are perfect way to experience one of the most dramatic periods in history. One of my favorite memories was the time I visited a top New York auction house and "inspected" an original album of Julia Margaret Cameron's photographs. I was allowed to leaf through it at my own pace, drinking in each expressive image and marvelling at the creativity of the middle-aged Victorian woman who produced great masterpieces in a converted chicken-coop. Julia Margaret Cameron's Women by Sylvia Wolf stirs up the same excitement and emotions as looking at the original photographs. The images are selected from the finest prints extant, and the reproduction quality is phenomenal. The book is a generous 9-1/2" x 12-1/2", permitting many of the photographs to be shown full-size. There are 64 full-color plates and 84 duotones. The text includes insightful essays with a great deal of new material--including information on Cameron's efforts to sell prints of her work and biographies of Cameron's models (and of the characters they portrayed). This 216 page hardcover is a vital reference--and with a reduced-size carte de visite by Cameron selling for $25,000 recently, it's as close as most of us will ever get to the experience of owning a collection of original Camerons. To order, just click on the title above. Highest Recommendation! Taken at the top of the world, these dazzling images capture the icy desolation and crisp, austere beauty of the highest mountains -- sights usually reserved only for adventurers. Laden with heavy camera equipment, the Italian Vittorio Sella trekked up the world's most challenging mountains, from Uganda to Nepal. The images he brought back were highly praised in their day, but Sella's works have been unjustifiably ignored for most of this century. Among the first to rediscover them was David Brower, the first Executive Director of the Sierra Club, who published a portfolio of them in the club's Bulletin in 1946. Brower encouraged his friend Ansel Adams to contribute an essay accompanying the pictures. Adams' article is included in this superb new book, together with essays by the mountaineers Greg Child and Paul Kallmes. Photohistorian Wendy M. Watson contributes an engaging and thoroughly researched discussion of Sella's life and photographic career. But it is David Brower, writing 60 years after his first encounter with Sella's astonishing pictures, who sums up these images in a comment on the "unbearably exquisite" photograph of Siniolchun, in Sikkim: "No mountain should be permitted to be that beautiful." Highest Recommendation! This 12.5 x 11 inch hardcover is 128 pages, with 125 duotones and two fold-out panoramic plates. Click on the title or cover photo to order. Joan Severa's knowledgeable commentaries turn the 272 images in this book into an illustrated tour of fashion trends through the decades. This book is a must-have for researchers and genealogists working on family histories, who use it determine the date a photograph was made. An important reference! Hardbound, 614 pages. Click on the title to order. This book offers 75 of Ansel Adams' greatest photographs reproduced as full-page duotones. Adams himself selected these images from the photographs that best represent his legacy--famous pictures like "Moonrise, Hernandez" and "Clearing Winter Storm, Yosemite," but also seldom-seen portraits and near-abstractions like "Surf Sequence--San Mateo County Coast." The 75 photographs in this collection are known as "The Museum Set," and make up the final portfolio in which Ansel Adams presented his remarkable life's work. A beautiful book, with a fine biographical essay by Friends of Photography Director James Alinder. 110 pages, 8-1/2" x 10-1/4", hardbound. Click on the title to order ... Or type "Ansel Adams" into the Search Box above for a listing of more than 100 titles by or about this great master of photography! 150 years ago, one of the greatest social upheavals of all time was taking place in the United States: the California Gold Rush. It was among the first major historical events to be recorded by the camera, but until now there has been no book devoted to its images.Silver & Gold is the first book devoted to the photographic documentation of the Gold Rush, bringing together 150+ daguerreotypes and ambrotypes--many never before published. The portfolio of images is impressive indeed--starting off with 50 full-page color reproductions. We see the miners as they set out for the gold fields and after their arduous journey. The camera takes us to the stream-beds and mining camps, to the stores selling gold pans and tobacco, to the rising city of San Francisco. The texts are not to be missed. Drew Heath Johnson provides insights into the role the daguerreotype played in maintaining emotional contact between the dislocated miners and their families far away. Peter Palmquist offers an irresistible tale of the "Daguerreian Holy Grail"--a missing mother lode of Gold Rush daguerreotypes that would be worth millions today. Our friend John Wood--poet and photographic historian--provides a surprising contemporary meditation on greed and hope and the American spirit. ...nowhere in photography does there exist so comparable an affinity as that between the daguerreotype and the ambience of the computer screen... We see that the screen's image retains the daguerreotype's silvery appearance and color, while avoiding the problems of handling and lighting. These links of new technology to an early, now archaic method of making photographs help us to see daguerreotypes as accessible, contemporary, and compelling. Of course, there are equally-good arguments to be made for fine photography books--of which Silver & Gold is a perfect example. It brings together a large body of rare and delightful photographs, and complements them with thought-provoking and informative readings. This is the most comprehensive history of photography book available. Dr. Rosenblum provides well-organized information on hundreds of 19th century and 20th century photographers and offers clear discussions of technological developments as well as artistic movements. Rather than sticking with tried-and-true classic images from familiar French, English and American names, Rosenblum supplements them with a treasure-trove of seldom-seen masterpieces taken all over the world. There are more than 800 illustrations in this 696-page hardcover book. It's beautifully printed and will be the cornerstone of any collection of photographic books. TOP REFERENCE CHOICE! Click on the title to order at a great price! Author Dee Kilgo has breathed life back into a long-forgotten photographic pioneer, piecing together bits of documentary evidence and surviving images to reveal Thomas Easterly as a remarkably sensitive and talented artist. Easterly was peculiarly--perhaps even obsessively--dedicated to the daguerreotype process. Long after the public shunned daguerreotypes as old-fashioned, Easterly stubbornly continued making them.... documenting the growth of St. Louis, gateway to the American frontier. His legacy, as presented by Kilgo, is a truly stunning record of Native Americans and mountain men, of outdoor slave auctions and shipwrecks on the Mississippi. Alan Trachtenberg of Yale University says "Easterly is a major figure...and Dolores Kilgo's book matches its subject in significance. It is simply the most accomplished and most important study of an American artist in photography yet produced." 248 illustrations, 63 in color. 234 pages, softbound. HIGHEST RECOMMENDATION! Click on the title to order this great book. Imagine yourself let loose in a room, given access to some of the finest daguerreotypes in the world. Not just a handful... but box after box....in fact, almost two thousand of them. This happy circumstance for Bates and Isabel Lowry came along with a daunting challenge: choose among them...make a selection from the Getty's fabulous collection for the world to see in a book. The result is The Silver Canvas, 78 precious images that give us a tantalizing taste of the Getty's impressive daguerreian holdings. There are some very famous pictures here: the haunting half-plate of Edgar Allan Poe, Mayall's mamoth-plate of the Crystal Palace, Southworth & Hawes' dramatic full-plate documenting one of the first surgical operations using ether anesthesia. But the authors have found some unexpected and surprisingly intimate gems by anonymous daguerreotypists: a placid French image of a woman reading to a girl, a luminous portrait of a young American sailor standing beside a barrel, and a tender American scene of a country girl and her pet deer. Bates and Isabel Lowry, both art historians, have done a superb job of researching their 78 choices. In addition to the text that accompanies each plate, there are notes in the back of the book providing further detail and documentation. An essay on the origins of the daguerreotype process is also provided. The Silver Canvas is beautifully designed and printed. One wishes that all of the 78 plates had been printed in full color, but that is a small objection in light of the wonderful opportunity this book provides us to look inside one of the world's greatest collections of daguerreotypes. Highest Recommendation! 8-1/2" x 11", 255 pages, hardbound. Click on the title above to order. Suddenly, the study of photography and society is a hot topic. Even The Wall Street Journal is taking note of the emergence of what's called "vernacular" photography as a collecting field. The Photographic Experience could serve as a guidebook to this "new" branch of research and collecting--it's the first comprehensive book on the cultural impact of photography, the result of decades of study by two of our greatest photographic scholars. We see the newly-invented medium quickly invading every facet of people's lives--as photography was reflected in literature, poetry, music, fashion and the popular press. Even one of Bridget Henisch's specialties--culinary history--comes into play (the 1862 recipe for "Photographer's Cheesecake" appears on page 57). There are sections on the camera's uses in wartime and in world travel, in the criminal justice system and global politics. Everything is carefully researched and the text is clear, thoughtful and entertaining. Then there are the illustrations... hundreds of them. Yes, there are masterpieces here--among them a spectacular daguerreotype of Jenny Lind owned by Britain's Royal Family. But you'll also find a neoclassical artwork sculpted from butter, a woman wearing a high-fashion hat that looks like a camera, and President Theodore Roosevelt's portrait framed in an outhouse seat. And that's only a hint at the visual surprises in store for readers of The Photographic Experience. 462 pages, 8-1/2 x 11 inches, hardbound. HIGHEST RECOMMENDATION! There's been an explosion of interest in painted and tinted photographs recently; they appeal to collectors of folk art as well as to many photography enthusiasts. The Painted Photograph features 130 illustrations (most in color, of course), including a stunning portfolio of painted oversize tintypes from the Collection of John O. & Libby Parker. The Henisches (see previous review) again provide a warm, entertaining look at their topic, thoroughly researched and accompanied by detailed notes. It's all here--everything from tinted daguerreotypes to those chalklike enlargements known as "Crayon Portraits." There's also a chapter on painted photographs from around the world. 242 pages, 8-1/2 x 11 inches, hardbound. HIGHEST RECOMMENDATION! Click on the title to order this book! If you haven't seen this book... prepare to be dazzled. Autochromes were made by the first truly practical process of color photography. After decades of tinkering by inventors and madmen around the world, the Lumiere Brothers of France succeeded where everyone else had failed. Their plates were coated with a simple black-and-white emulsion, together with a layer made up of millions of microscopic grains of potato starch, dyed in primary colors. The end result was a process simple enough for an advanced amateur to use, and capable of producing rich, glowing color photographs on glass. Fine autochromes have been compared to stained glass windows and pointillist paintings. When the Lumieres brought the process to market, Alfred Stieglitz predicted "Soon the world will be color-mad." Our esteemed friend John Wood offers readers a look inside his personal collection of autochromes, providing examples by Stieglitz and his circle: Eduard Steichen, Heinrich Kuhn, Frank Eugene, George H. Seeley and Paul B. Haviland. Other important photographers represented in The Art of the Autochrome include Arnold Genthe, Karl Struss and Adolf de Meyer, but many of the names behind the most exciting images in this book will be unfamiliar to most readers. There are surpassingly beautiful portraits (and one luminous view of a porch at sunset) from a group of 50 by J. B. Whitcomb. Little is known about this photographer, whose autochromes were rediscovered in 1985. We have more information about the French professional photographer Antonin Personnaz, whose dazzling scenes of harbors and country lanes have a clear connection to the works of Monet. And The Art of the Autochrome presents a selection of wonderful images by Gervais Courtellemont, who published more than 350 autochromes in National Geographic during the 1920s. In all, there are 75 full-page plates in The Art of the Autochrome. A dazzling book and a wonderful gift for anyone who enjoys photography. Highest Recommendation! 200 pages, 8-1/2" x 11", hardbound. Click on the title above to order it instantly! Looking for something else? Type a few keywords in the box, then click "Go!" Your purchases help to support this site. Thanks! We'll be adding additional reviews and recommendations, and hope you find this feature helpful. Your comments and suggestions are appreciated. Prices and availability are subject to change without notice. Copyright © 2003 The American Photography Museum, Inc.